Safarri.com is a web site claiming to represent the "Future of Classifieds". They apparently aggregate classifieds from a variety of sources. Aubrey Falconer contacted me by E-mail over the weekend to let me know he had released a new Google Earth capability which lets you view classified ads georeferenced into Google Earth. According to Aubrey "...it gathers classifieds listings from Google Base, Oodle (and soon Vast), matches them against any set of filters you specify, and then overlays them on Google Earth as you are flying around!" You can set up a filter to look only at the information you want. For example, you can look just for "Vehicles" and filter for "Lexus" and between a certain price range. Or, you can look for real estate, household items, electronics, collectibles, books, etc. Safarri's Google Earth application allows you to search anywhere in the world. After you use the requester to select your criteria, you "Connect Safarri to Google Earth" (which loads a network link into Google Earth with your search criteria), then browse to the city you want to search. It researches the database each time you pause over a city. It can take several seconds to check the database. If the network link stops searching and you see no placemarks, then there's no match for that city. I would suggest a single placemark pop up saying "No items found." or something. When I searched for cars in other countries, there weren't nearly as many matches as in the US. I guess Google Base isn't as big in other countries yet? 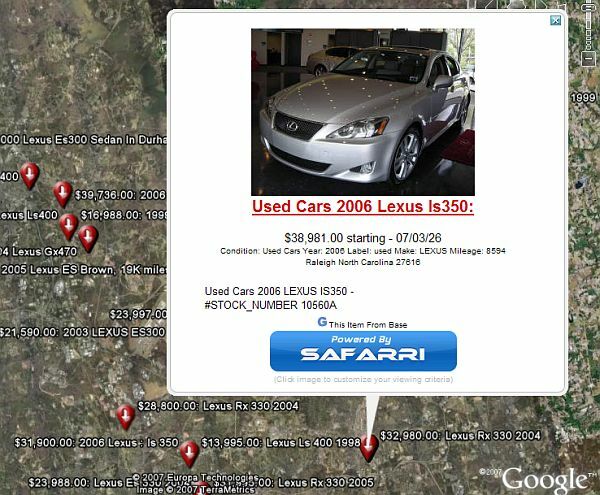 However, as Safarri aggregates more data from other sources, presumably you will be able to use Google Earth to do your classifieds shopping almost anywhere (at least in theory). I'd like to see a capability like this for Craigslist! I agree about the "no items found" placemark, and have just added it. I am constantly working on adding more features to Safarri. Look for more neat things coming soon!